This project was lots of fun. I don't mean emptying the wine bottles, though that was most enjoyable, I am referring to the pumpkin wine bottle cosy. My nephew says it looks more like a giant carrot, but it is ribbed like a pumpkin. I'm really happy with how it hugs the wine bottle. I am going to make another for a bottle with lower shoulders, such as the now empty bottle shown at the right of the photo. Instructions are not available at this time; I will make notes as I knit the next one and then write them up as a tutorial. I trust that you are all stitching up a storm. This changing/cooling weather, has me thinking of warm cuddly clothing. There is a new cowl so to be in the works, an afghan for a friend and .... (far too many ideas). Mister Linky is waiting below. I have upgraded and ma now using the Linky with thumbnail photos. Not quite sure how it works, though any bugs will get worked out. Tasha and Cole have been friends for years, but have never strayed across that friendship line. Now they both want to rent the same sea front shop in Mangonui, in the Northland of New Zealand, and neither will back down. A rash statement has led to a challenge, date for the next week and a half. The one who falls most for the other loses the rental. Both of them figure they'll easily win. Both are scared of losing a dear friend should the romance fail, but the stakes appear too high not to try. I enjoyed following their romance. Both of them trying to seduce the other without falling head over heals in love. It had me cheering for both of them at different times. Yes, I am a romantic at heart and not ashamed to admit it. 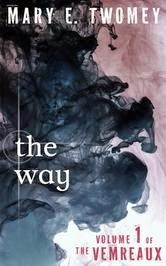 Author Serenity Woods also writes epic fantasy under the pen name Freya Robertson. Thanks to author Serenity Woods for my free review copy. This ebook is currently free from several online retailers. In a world where blood type determines your lot in life, A means a life of labour, B leads to a life of privilege and O to isolation on a distant island where the residents blood is harvested. As an A, Blue Anders has known no other life, than hard work and continual physical training by her brother. Her unbeatable strength has led her and her brother Baird to believe that she is the Light, the one that will fulfil the prophecy to free the Vemreaux from that which threatens them. This is quite the world that author Mary Twomey has created. It appears to be a possible future of our own world. I love the careful attention to detail, such as all girls born in the same year, have the same middle name. To add a twist to the population, she has given the Bs the opportunity to undergo the Change to extend their life span by many decades. There are strict class rules which seem quite daunting, though they do thin within the work place. The lowest of Bs always outrank As, yet Baird still manages to keep control of the activities within the business he manages. Makes this a very real society in my view. The role of family is explored in this novel. Elle and Grettel are not related to Blue and Baird, yet they live together and care for each other as family. These bonds are further tested when several Vemreaux become involved with the siblings. The further I got into this story, the more I liked Blue and even Baird. I did not want to book to end, but I wanted to find out what happens, did she fulfil the prophecy. Cover image courtesy of Kobo. This is my sister Nancy, who I made the scarf for. Looks lovely on her and is sure to keep her ultra warm this winter when she is walking around on the blustery streets of Calgary. Yes, it was knit using weather statistics of that city. As it turns out, all those who submitted guesses as to the location selected Calgary. It was that snowy period in September that gave it away. My sister pointed out that the scarf is long enough to share with your sweetie when out for a stroll. Smart lady. Did you notice that Nancy has bare feet. Rather a contrast from the overkill of the scarf. While she was visiting we followed the Chocolate Trail in Stratford, Ontario. A fun afternoon adventure, and rather tasty. Have I kept you waiting long enough. The winner of the contest, selected by Rafflecopter, is Marie. She has won a gift certificate to Book Depository (one I figure out how to purchase one). The weather is getting chillier here and making me want to knit socks. For those readers who knit socks, what is your favourite pattern that you have either used or plan to use. Mister Linky is waiting below for a link to your current needlework post, or to a link about the socks you have knit. This book is comprised of Shards of Honor and Barrayar. Commander Cordelia Naismith is a strong female character who has commanded a survey ship and crew, led a military mission, saved the life of a young emperor and saved his country from total chaos. When I first met her at the beginning of this book, she was in full control of her crew and ready to handle any disaster. A few pages later, she is confronted by Captain Aral Vorkosigan and almost immediately she is attracted to him and having romantic thoughts even while she contemplating how to escape from him. At this point I thought the book was going to be a romance novel, not what I was looking for. I kept reading and found that was not the case. Yes, there is romance, but it is only one part of the story between Cordelia and Aral. Author Lois McMaster Bujold has created a complex world on Barrayar. They are a space faring race with advanced technology in their hands, yet they also have long standing issues of class divisions, power struggles and gender roles. I did ponder the hints of a Russian heritage for the founding of the planet. Hopefully the founding of the planet will become clear in subsequent books in the series. 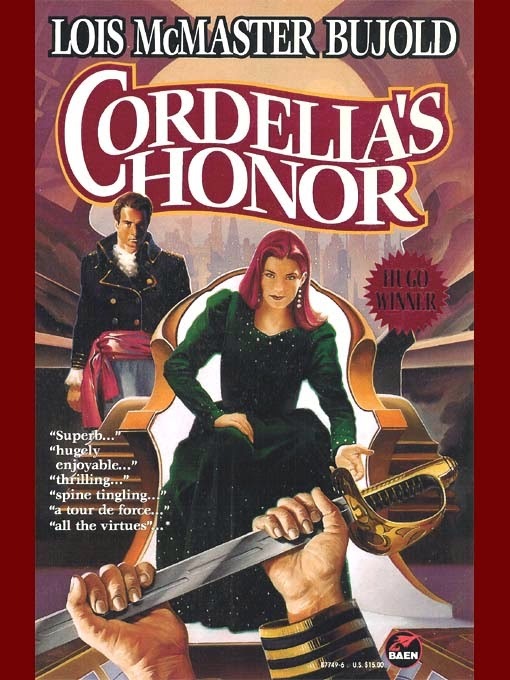 One of the strengths of this book is the great characters that surround both Cordelia and Aral. Piotr Vorkosigan, father of Aral, is an aristocrat through and through. He does love his son, though not in a warm cuddly way, rather for the prestige that Aral can bring to the family name. Fellow soldiers Koudelka and Bothari are definitely men that you would want on your side in any battle and Drou, though not a soldier is certainly more than capable in her role as bodyguard. As I finished reading this book, I was already wondering about the fates of these characters and whether they would play a role in in the next Vorkosigan book. Thanks to Baen Books for use of the cover image. I love watching fireworks, from the brilliant sparkles to the reverberating explosions. They are like magic, dancing across the sky. Author SJ Parkinson envisions fireworks with a more sinister motive in his newest novel Twinkle. On July 4, Sir Marcus Brandon, the wealthiest man in the world, wants to celebrate the launch of GNI, (Global News International) with a fireworks show. To ensure worldwide enjoyment, he has arranged for it to be shot from satellites in orbit. Inexplicably, all who viewed the fireworks start to go blind twenty-two hours later. Only a handful of people around the globe, those who didn't view the fireworks, retain their vision. This book is set in the United States, but easily could have been located in any of the world's major cities. Much of the plot is centred around various levels of the military and the President, though the medical and general public are critical to the plot. While I don't usually read military inspired stories, I was captivated from the first pages. For two days I couldn't put this book down. The military discipline and procedures worked well in this story. I wasn't lost by the unfamiliar terms, locations or processes of NORAD or the army/navy as Mr. Parkinson included succinct footnotes that answered my questions before I even knew to ask them. Security surrounding the American President was paramount in this plot and explained equally as well. 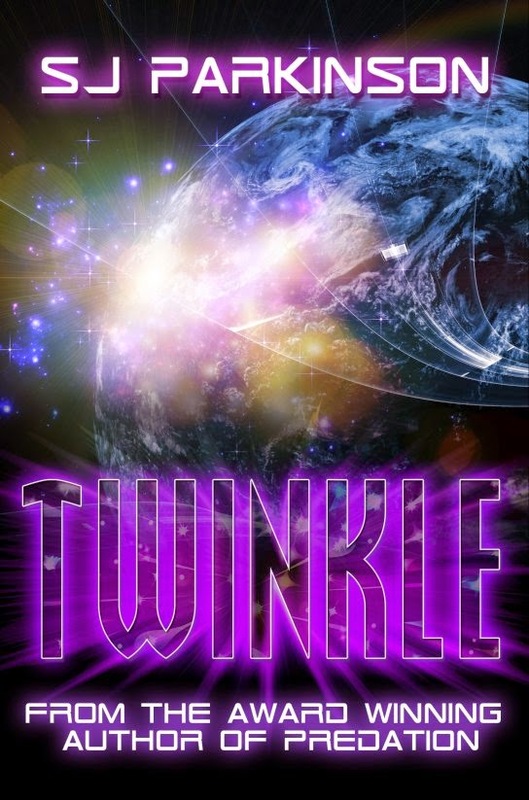 Twinkle is fast paced, occurring over the course of a two week span. There are frequent jumps between the main characters and locations, each is easy to follow and there doesn't leave gaps in the narration. Even though the story moves along quickly, there is sufficient detail such that I felt as though I knew several of the characters. My favourites being: Dr. Krause who was working to cure the blindness, Oscar Blake who was a patient of the doctor and missed the fireworks, and Colonel Alvin Smith who was on duty at NORAD during that night. I recommend reading the author's end notes where he provides additional information clarifying fact from fiction with regard to both the blindness and the military. This is a well contrived story and should appeal to a wide range of readers. For a chance to win a copy of Twinkle and four additional books by SJ Parkinson, use the Rafflecopter form below. Thanks to Virtual Author Books Tours and author SJ Parkinson for my review copy. As well as creating useful items, such as hat and scarves, I get pleasure making decorative items. A wine bottle doesn't really require a cosy, but they sure do look cute. These will be finding their way to one of my cousins. Her husband's family owns a winery, so I felt these would be welcome. Both patterns are available free online. I used to base pattern from the cabled bag on the green eyelet bag, though I adjusted the number of stitches. I did eight cable repeats. It was busy this past week with a visit from my sister and then Thanksgiving dinner with more family. 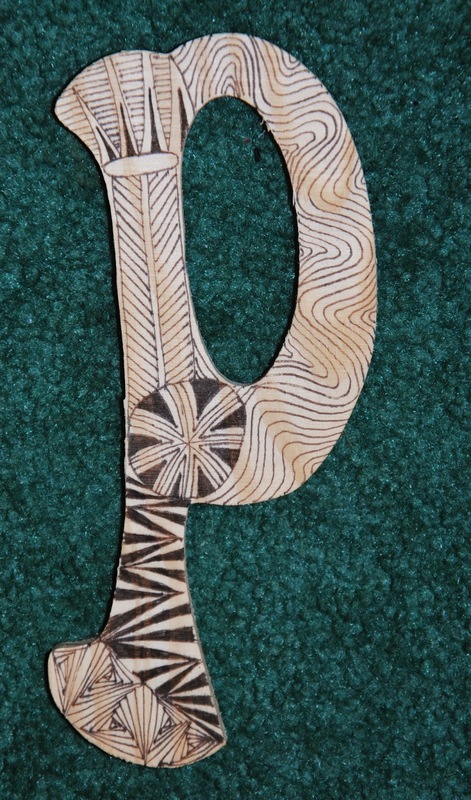 That didn't leave much time for stitching. 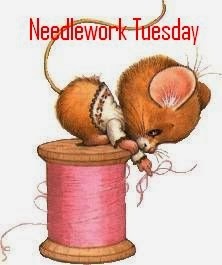 Did you have time to do any stitching this past week, Mister Linky is waiting below for a link to your current post. Generally an author starts at the beginning of a story and proceeds to the natural ending. In this instance, author Rebecca Makkai has successfully done the opposite. She has started near the end, just prior to the turn of millennium and the threats of the Y2K bug. Zee and her husband Doug have returned to her childhood home and taken up residence in the former coach house. For many years there had been an artist colony housed on the grounds, and Doug is obsessed with gaining access to their files. Somehow he must find a way past his secretive mother-in-law's guard. A fateful confrontation with her on New Year's Eve and a serious mis-communication leads to even more questions rather than the long sought answers. 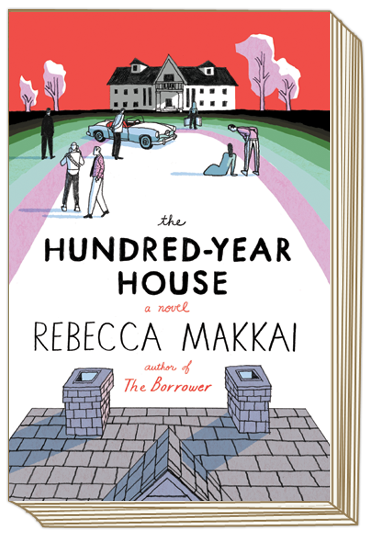 Once this time line draws to some reasonable conclusions, Ms. Makkai skips back in time to when Zee's parents first arrive at the house over forty years earlier. Once again, we are treated to some revelations but also to further questions. This process repeats back through the hundred year history of the house. I have to admit that I really didn't like most of the behaviour of the modern residents. They all had secrets they were keeping and when they did talk with each other, they were poor communicators. More walls than openings. Once we had travelled back to the arrival of Zee's parents at the house in 1955, I got more interested in what was happening. I still didn't find Grace and George to be likable people, but at least I could understand their behaviour. From this point, the secrets and the revelations just kept getting more fascinating and unexpected till the point where I could hardly put the book down. It was interesting to have this look inside the artist colony and see the interactions between the various guests. I can imagine that such interactions could certainly spur their imaginations and output. There was an intriguing sounding cocktail mentioned in the book, White Lady, and I had to verify whether it was a creation by the author or a real drink. It was easy to check and it certainly does exist. I love that mix of fiction and real. Mix in a shaker with ice, strain and enjoy.